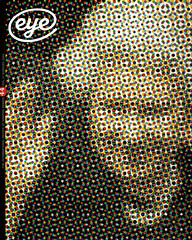 ‘In a world where Photoshop has outed the photograph as a liar, one can now allow artists to return to their original function – as reporters.’ Art Spiegelman. 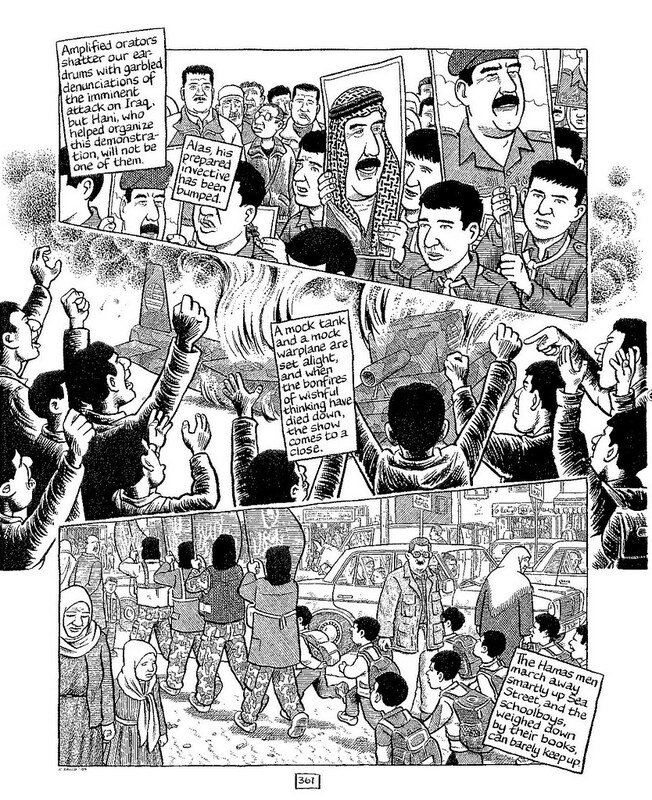 The original Palestine comic series won the 1996 American Book Award and Sacco’s eyewitness illustrations have since been exhibited across the us. (Time magazine favourably compared Palestine with Art Spiegelman’s Pulitzer prize-winning Maus, an anthropomorphic account of the Holocaust. However, while both titles employ the cartoon form to heighten impact and engagement, Sacco’s work is the more nuanced and sophisticated of the two.) The book’s fluid imagery – described by one critic as ‘endless mud and obsessive cross-hatching’ – is memorably atmospheric and faithful to the landscapes and cities of Palestine. It also evokes an almost surreal routine of bureaucratic harassment, roadblocks and tear gas, punctuated only by moments of mordant humour. Despite the careful characterisation of those around him, Sacco’s cartoon self is slightly unreal – a grotesquely exaggerated figure, complete with enormously elastic lips – a formlessness that, rather curiously, invites identification. However, Sacco’s draughtsmanship is perhaps best demonstrated by his complex crowd scenes, with their differentiated faces, pointed detail and disjointed snippets of overheard speech and interior narrative. With Palestine, as with his other major work Safe Area Gorazde, Sacco has assumed the unlikely role of the pre-photography war artist, while fruitfully exploiting the narrative and textual devices of the comic book. Others have employed the comics form to tell political, non-fictional or biographical stories – among them Steve Darnall, Peter Kuper and Ho Che Anderson – but Sacco’s work is unique in its scale and ambition. Approaching such daunting topics with a disreputable and supposedly juvenile medium may seem futile, even absurd, yet Sacco’s greatest achievement is to have so poignantly depicted contradiction, oppression and horror in a form that manages to be both disarming and disquieting. 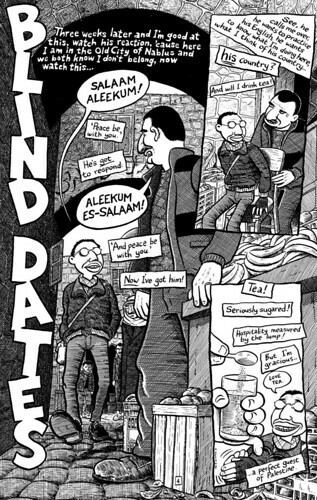 Palestine not only demonstrates the versatility and potency of its medium, it also sets the benchmark for a new, uncharted genre of graphic reportage.